Character Profile: Fractal's Swooping In! Welcome new backers. As we grow closer to our goal we'd like to start pulling back some of the curtain on some more plot and development elements in the game.And who more perfect to start with than someone backers know nothing about- Fractal. Fractal is a millennium old, coming from the world before it was what it was. Which is to say there was a much different world before, that has by and large been hit with a big reset button long ago. In the final lull of the world before, the celestial being of Centaurus appeared to her. Knowing the dire state of the world and unable to manipulate it alone tangibly, it chose Fractal to bond to because she was alone, deserving, and pure of heart. Known as one of their many deities by The Almagest, its curse has transformed Fractal from human to a powerful being with near unbound ability- becoming the witch we know and love. In the millennium that followed, Fractal used her powers to solve others’ problems. This grace extended to much bigger and unusual problems that sway to the side of the very magical. Occasionally she’d run into beings similar to her in that they too were in contact with magical beings and gifted with powers. Some of these beings Ray will come to meet herself in the game, while others Ray will come to fight. Ray meets Fractal by accident after trying to break into her home unknowingly (more on this in a later update). Triggering the alarm system to her home, Fractal uses her magic to summon Ray to her feet immediately to address the situation. On a quest herself, Fractal understands how to solve Ray's dilemma. She opts to recruit Ray to help her own time-sensitive quest first. This is where the game begins. Good question, me. The root of this question is part of the heart of the mysteries of Prisma and its plot. Masks in the world of Prisma play a very large part of the plot so we don't want to give too much away, but regardless it's much more than an impressive fashion statement. So for now, we will choose to keep that particular secret to ourselves. Wait. What's The Almagest? Centaurus? I want to know more! Contain your excitement, me. We plan on going in depth on all these ideas in the full game. But also, all of the backstory of Prisma will be included in an old-school parchment style world lore booklet for those who back in a high enough tier. But wait, you don't have to wait that long. If achieved, we will reveal Fractal's page excerpt from the booklet with many more details and nuggets of backstory that you may find intriguing. Speaking of which, we seem to be well on our way. Good job everyone! For now, that's all we have for this update. In the next update we will continue to pull be the curtain by covering some more technical development topics. Add-Ons! We Are Close to the Goal! Welcome new backers. 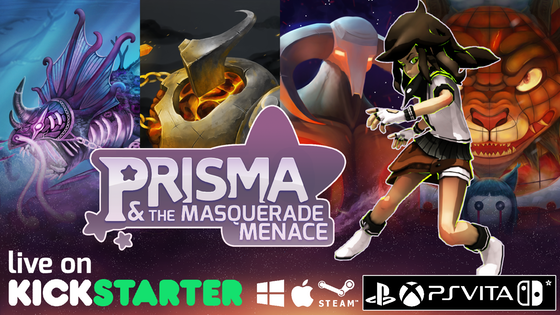 We are almost 75% percent of the way to making Prisma a reality! We appreciate everyone's support so far! Remember to tell all your friends about us! This update has been a long time coming, and our apologies that there has been a lull in recent updates. The team has been hard at work at GDC trying to make new fans, which may indeed be some of you out there. We want to address Add-On's for pledges in detail here for everyone below. An Add-On is a reward that you can get À la carte by adding extra money to your chosen tier reward. It can be any combination of rewards, digital or physical, that we have listed on our campaign. This is most beneficial for those who want multiple game copies or physical rewards, or those who want a higher tier reward (such as a vinyl) but don't have the money to put into said tier. As a note, this does not include all of our tier rewards. Certain tiers that include one-of-a-kind items and touchstone items like beta access come only with the tiers they reside in or higher. For maximum effect, if you ARE sure that you want an Add-On, we recommend pledging the extra money during the campaign via adjusting your pledge. It is much more beneficial to the campaign if you pledge the extra money up front instead of later. Add-On's will be up for selection through BackerKit after the campaign ends. Through BackerKit you can either use any extra money pledged over your selected funding tier in the campaign as currency to select Add-Ons at no extra charge. Alternatively, if you feel like you want an Add-On after the campaign is over but have not added in any money over your tier, you can pay to have the selected Add-Ons of your choosing entirely within BackerKit after the fact during our reward confirmation surveys that we will be sending out to everyone. Expect the main Kickstarter page and FAQ to be updated with this information by the time you lovely people see this. Until then stay tuned for a few more surprises and much MORE FREQUENT UPDATES! these final 10 days are going to roll in like a landslide if we have our way. Thanks to all the new faces who’ve joined us in Kickstarting Prisma. We have entered the final 10 days of the Kickstarter. We are introducing backer achievements to gamify spreading the word to as many eyes as possible. Fret not, there are a lot of potential prizes on the line. From reveals from within the game and tier rewards to (offsite) giveaway unlocks of custom one-of-a-kind rewards. Fulfill achievement requirements to gain Achievement Progress points. The more points that are collected, the more reveals, rewards, and extras will be unlocked. So spread the word and get the momentum flowing for the campaign- Collect all 12 to unlock everything! We are all very close to making our goal. With any luck we can smash the goal and blast right into the running for a stretch goal or two. It all depends on all of you when it comes to spreading the word. Rewards are listed below with the achievement numbers to the left. Details and images will appear as achievements are unlocked, followed by detailed updates. Now everyone is an honorary Prisma scout. Go out and spread the word of the Kickstarter and take the game as far as you can...and who knows? Perhaps become a character in the game yourself. And as always, thanks again to everyone who’s backed so far. We appreciate each and everyone of you. Thanks for investing in keeping the dream alive. WE ARE OVER HALFWAY THERE!!! To assist with the Prisma campaign we turned to our families and close relatives and asked if anyone could help give Prisma a good, solid push. We believe in the project and from the support you've shown us thus far, you do too. We cannot thank you enough for the belief you have for the project and putting your faith in us. Thanks again everyone. WE CAN DO IT! $8,000.00 and 19 days to go and let's have at those stretch goals! Yukiburu Mountains. A.K.A. NOT the Desert! Thanks to all the people who have backed. Welcome backers! But that's enough small talk, let's get to the point. Everyone's inner Anakin is screaming right now. We hear your "Is this game only a desert? ", "Castles and Sand? Who cares? ", "I hate sand. It's coarse and rough and irritating and it gets everywhere." Don't fret young Skywalker. There's are many worlds out there for you to explore. In today's update we are going to focus on World 2, which are the Yukiburu Mountains. It's a Japanese inspired snowy mountainous region where Ray and Fractal visit during a festival. There are many creatures unique to the region there. Several bison humanoids roam the land and have set up several tiny villages. They huddle under the great unifying bell that connects both halves of Rift Mountain. A Mendo, a docile and aggressive dog, seal, lion...thing. He's cute at least. The bell is said to hold the bison-people's deity- Yuki, the puppeteer. She has the ability to control and manipulate objects and others with the power of music. Yuki and Neb in their forms. During the mix, there will be a lot of festival arrangements going on. Several items like food stalls, festival lights, drums, and market fronts liter the street more and more as you get closer to the center of the festival. Stall and Food Concepts for knocking over. Even aspects of the game, like moving platforms, will have a different flavor in Yukiburu. We want each world to have their own hints and identity and full of style! That's all for this update. Let us know your thoughts on Yukiburu below. And make sure to spread the word if you like what you see. There's plenty more to come.